The freshness of spring always reminds us that it’s time for a thorough cleaning. With so many home cleaning products on the market, I want to showcase the designs of ones we admire (and that clean wonderfully as well). Hierarchy of typographical content. This may include how product names are identified, key ingredients, and top product features. An incorporation of the existing visual brand and packaging style. While some brands are known only for cleaning products, others are part of a more extensive collection of products. The brand is stronger when all products are consistent in design style. The use of colour and complementary patterns to identify different products or scents within the collection. Strong consistency across label designs. This helps buyers easily identify the product on store shelves. Saje recently released a line of home cleaning products which include a multi-surface spray, window and glass spray, and bathtub and tile cleaner. Their products feature essential oils and natural cleaning ingredients. The Caldrea product line includes kitchen cleaners, laundry detergent, and home cleaners. Caldrea is best known for its use of bold colours and distinct patterns to differentiate each fragrance family among its product line. The Honest Company features a plant-based line of cleaning products. A redesign of the packaging was introduced this past year to promote easy identification of the key scents within the collection. The new design promotes photography and limits colour. The Mrs. Meyers Clean Day collection offers many products and scents including dish soap, hand soap, and cleaning sprays. 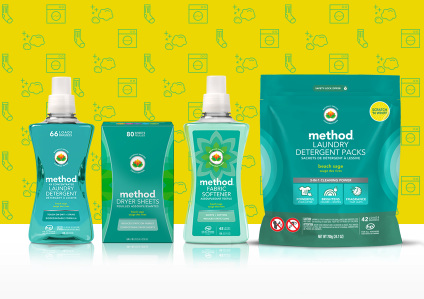 Method is known for their uniquely designed and effective plant-based cleaning products. The exceptional design of their packaging and bottle shapes certainly stands out on store shelves. We hope you’ll notice some of these outstanding design features the next time you’re in the market for some exceptional cleaning products.